Epic Poetry Reading at Troy Interfaith Group's Authors' Night, Troy, Michigan. 11 minutes. Hosted by Central Woodward Christian Church, Troy, Michigan. October 1, 2018. Epic Poetry Reading at The Farmhouse, Village of Franklin, Michigan. March 22, 2018. 15 minutes. Funded by Poets & Writers, Inc.
On the moon, Black Elk and Chief Seattle; The Poet-Prophet Job on the Holocaust. Funded by Poets & Writers, Inc.
As a global epic tale, I am speaking to the entire planet, not merely the Western world. While the whole is always more than the sum of its parts, I gratefully acknowledge my indebtedness to such writers and thinkers as the historian Arnold Toynbee, Carl Jung, Huston Smith, Aldous Huxley, Joseph Campbell, and many others of open and universal sensibility. Campbell and Mircea Eliade, especially, wrote on shamanism and myth and their power to heal the tribe through a visionary, ecstatic experience and tale. Campbell also wrote repeatedly about the overview Image of Earthrise, rising above the horizon of the moon, as the great new mythic Image and Symbol for our time. Reading at Hannan Cafe and the Detroit Public Library. Best Selections 2015 - 2017. (The reading at Hannan Cafe funded by Poets & Writers, Inc.) The story of humanity, from Blombos Cave to the dark side of the moon, drawing from and evoking all of the great spiritual and wisdom traditions and regional civilizations. Apollo, the Greek god of poetry, calls all the poets of the nations, ancient and modern, East and West, to assemble on the moon to consult on the meaning of modernity. 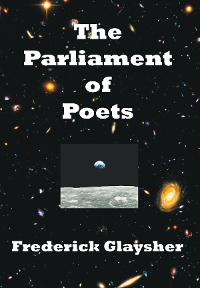 The Parliament of Poets sends the Persona, the Poet of the Moon, on a Journey to the seven continents to learn from all of the spiritual and wisdom traditions of humankind. On Earth and on the moon, the poets teach a new global, universal vision of life. Epic poet, rhapsode seeking invitations to read. "A great epic poem of startling originality and universal significance, in every way partaking of the nature of world literature." —Hans Ruprecht, Carleton University, Canada, author on Goethe, Borges, etc. Search YouTube for "Epic Poetry Readings" or Playlist.